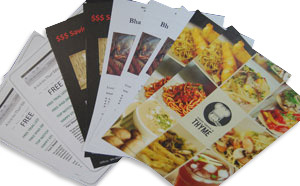 38% off for flyers/brochure printing for any quantity, sizes and material. Promotion from 1st - 30th April. Price shown on below is before discount. 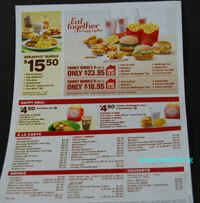 Distribute flyers is one the popular and effective marketing method in Singapore. But the cost per piece is not cheap if your flyers printing quantity is low. 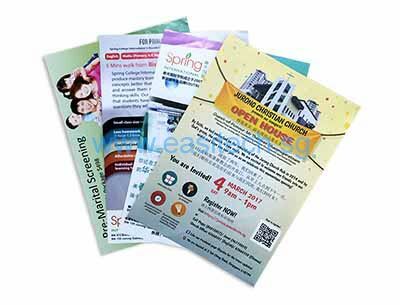 With the latest IT technology, Easitech is glad to offer very low cost flyers printing with high printing quality. To reduce the printing cost and pass the saving to customer, Easitech is combining the printing jobs together. So that, customer can prints flyers in low quantity but enjoy the cheap price of high volume flyers printing. Brochure is one the basic marketing material for every organization. Due to low quantity needed, printing brochure is usually using digital laser printing process which cost a lot more if your quantity above 500pcs. Base on the combination of printing jobs, Easitech offers another option for brochure printing Singapore with high quality but low cost. *Other size please email to sales@easitech.sg for quotation. *Art card material only able do creasing line. Similar to the photocopier paper in office. Surface of paper is not glossy. Common used for flyers and brochure printing. Surface of paper is glossy. Below is the flyers design template or brochure design template in A4 or A5 size. Please select design template with half fold or tri-fold brochure design template if you like to have folding on your brochure printing. Click here to download brochures or flyers template in adobe illustrator format. Please follow the design guides below to ensure your brochure or flyers printing will have high quality result. 1.Bleeds are required in all artwork with an image extending to one of the borders. Add 3mm on each sides to allow for cutting. Refer to diagram above. 2. Your texts and designs should be 4mm away from actual size edge(Safety zone). This will guarantee your texts or designs will not be cut off. Please state your folding type in "Remark" on online order.